Bedigian, D. (1984). Sesamum indicum L. Crop origin, diversity, chemistry and ethnobotany (Ph.D. thesis). প্ৰকাশক Urbana-Champaign: University of Illinois. Bedigian, D. (1985). "Is še-giš-i sesame or flax?". Bulletin on Sumerian Agriculture খণ্ড 2: 159–178. Bedigian, D. (1988). "Sesamum indicum L. (Pedaliaceae): Ethnobotany in Sudan, crop diversity, lignans, origin, and related taxa". In Goldblatt P., Lowry P.P.. Modern Systematic Studies in African Botany. AETFAT Monographs in Systematic Botany. 25. প্ৰকাশক St. Louis, MO: Missouri Botanical Garden. পৃষ্ঠা. 315–321. Bedigian, D. (1998). "Early history of sesame cultivation in the Near East and beyond". In Damania A.B., Valkoun J., Willcox G., Qualset C.O.. The Origins of Agriculture and Crop Domestication. The Harlan Symposium. প্ৰকাশক Aleppo: ICARDA. পৃষ্ঠা. 93–101. http://web.archive.org/web/20080401040905/http://www.ipgri.cgiar.org/publications/HTMLPublications/47/ch07.htm#bm4-Early%20History%20of%20Sesame%20Cultivation%20in%20the%20Near%20East%20and%20Beyond%20D.%20Bedigian. Bedigian, D. (2000). "Sesame". In Kiple K.F., Ornelas-Kiple C.K.. The Cambridge World History of Food. I. Cambridge University Press. পৃষ্ঠা. 411–421. Bedigian, D.; Korošec-Koruza, Zora (2003). "Evolution of sesame revisited: domestication, diversity and prospects". Genetic Resources and Crop Evolution খণ্ড 50 (7): 779–787. doi:10.1023/A:1025029903549. Bedigian, D. (2003). "Sesame in Africa: origin and dispersals". In Neumann K., Butler A., Kahlheber S.. Food, Fuel and Fields — Progress in African Archaeobotany. Africa Praehistorica. প্ৰকাশক Cologne: Heinrich-Barth-Institute. পৃষ্ঠা. 17–36. Bedigian, D. (2004). "History and lore of sesame in Southwest Asia". Economic Botany খণ্ড 58 (3): 329–353. Bedigian, D. (2006). 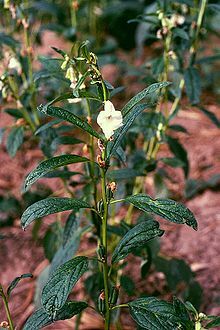 "Assessment of sesame and its wild relatives in Africa". In Ghazanfar S.A., Beentje H.J.. Taxonomy and Ecology of African Plants, their Conservation and Sustainable Use. প্ৰকাশক Kew: Royal Botanic Gardens. পৃষ্ঠা. 481–491. Bedigian, Dorothea (2010). 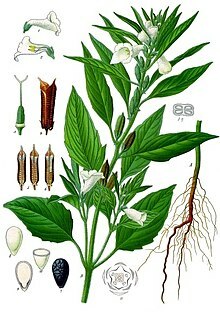 Sesame: The Genus Sesamum. প্ৰকাশক St. Louis: Missouri Botanical Garden. ISBN 978-0-8493-3538-9.